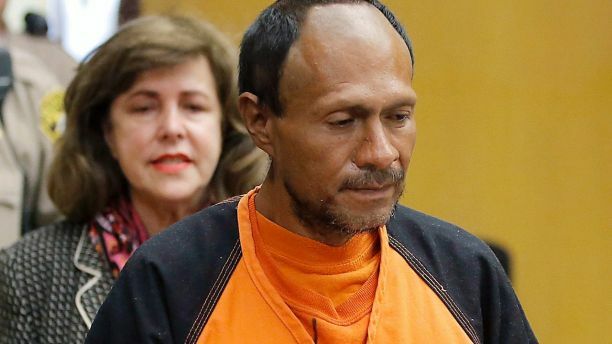 The illegal immigrant and seven-time felon who was acquitted of murder and assault in the 2015 San Francisco fatal shooting of 32-year old Kate Steinle was sentenced to three years in prison on Friday. The case sparked national debate over immigration reform and so-called Sanctuary Cities that shield illegals from deportation, of which San Francisco is one. The felony possession was the only conviction to come out of Garcia Zarate’s trial in November. The jury decided Steinle’s death, the result of a ricochet bullet fired from roughly 100 feet away, was an accident. At a hearing Friday, Garcia Zarate entered the courtroom wearing huge oversized bright orange sweatshirt and sweatpants. He was uncuffed and smiling as he shook the hand of each member of his defense team, including new attorney Tony Serra. His attorneys requested a new trial, but the judge denied the motion. Garcia Zarate is expected to be turned over to U.S. Marshals to face new charges in federal court, under an indictment handed down on Dec. 5. A federal grand jury has charged Garcia Zarate with being a felon in possession of a firearm and ammunition and being an “illegally present alien” in possession of a firearm and ammunition.